The Dandie Dinmont is an intelligent breed originally bred as a working dog. Dandie Dinmont Terriers are now included on the vulnerable native breed list by the Kennel Club due to their decreasing numbers and shrinking breeding stock. The founding father of the breed was Old Ginger, who was born at The Haining Manor House in Selkirk, in the Scottish Borders. Last year, a bronze statue of him, funded jointly by the Dandie Dinmont community and the Kennel Club, was unveiled at the kennels where he was born. These are the only surviving kennels in the world to which a founding father, of any breed, can be traced back. The old kennels building has now been transformed into the Dandie Dinmont Discovery Centre, another world-first breed centre of its kind. Dandie Dinmont Terriers are starting to make their mark in the dog world, thanks, in part, to the hard work of a small group of fans. Here’s the lowdown on the characterful Dandie Dinmont. Currently on the Kennel Club’s vulnerable native breeds list, there were just 130 dogs registered in 2017, although this was an increase on the 91 registered the previous year. As with many terriers, Dandies are fairly flexible when it comes to exercise, and will walk for as long as you’d like, as they have plenty of stamina. They are typical terriers in that they like to have a good sniff and chase, and, once they have a scent, they may be prone to selective deafness, so make sure they have a good recall, or are kept on a long lead. They also enjoy taking part in activities such as rally and agility. When it comes to training, they are not naturally obedient, and can have a bit of a stubborn streak, particularly if they think their way is better than yours. A firm but fair hand when it comes to training is necessary; your breeder may be able to offer you some advice. Although Dandies are very adaptable, they do need daily walks to keep them stimulated. New owners are recommended to attend puppy training. Dandie Dinmonts are known to be one of the most placid breeds in the Terrier group, and aren’t as yappy or snappy as some of their counterparts. They are an affectionate breed. They love human company, and can bond quite strongly with younger members of the family. Generally, they are good with other dogs, and are always happy to make new friends, but they are also excellent guard dogs, and will fearlessly defend their owners if they suspect any conflict. They should get on fine with well-socialised cats. Dandies are generally known as a healthy breed with few issues. But as they have long spines and short legs, they do need to be reared with care in the first six months of their lives. As of January 1, the Kennel Club requires the breed to be tested routinely for glaucoma, and that only those dogs with a favourable test result are used for breeding. Dandies make good family dogs as they are known to be gentle and patient with children, and will build a strong friendship with them. They are also good with other dogs and pets, as long as they have been well socialised from a young age. They would prefer a home with a garden, but, as they are flexible, they are happy to live in the city or in the country. As with most breeds, they won’t enjoy being left alone for long periods — it’s not recommended for more than four hours. 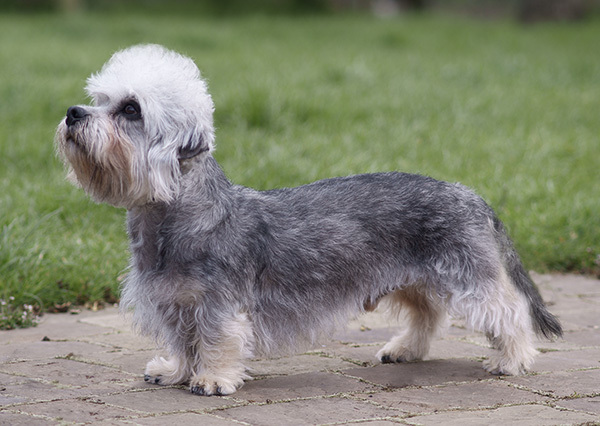 The Dandie Dinmont’s lustrous coat, which comes in either mustard or pepper colours, is one of its most distinguishing features. Dandies have a double coat, with a soft undercoat and harder topcoat, which has a crisp — not wiry — feel, and, of course, is characterised by the sweet little topknot of hair on top of their heads. They don’t moult, but still need to be brushed every other day to avoid matting or knots in the fur. They also need to be hand-stripped three or four times a year; clipping is not advised.